Give the little ones in your life the priceless gift of music and quality family bonding time! Simply click on the image and print out to give the gift - be sure to fill in your ORDER ID -- this is the code your recipient will use to redeem the gift certificate when registering. If the recipient is already registered and on an installment plan we have applied the credit to their payments. 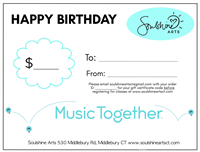 Give the gift of music for their Birthday!